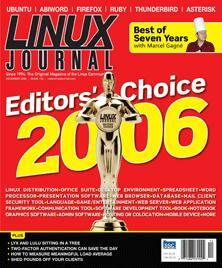 Linux Journal editors pick their favorites. LyX beats word processors for publishing. Can a USB pendrive work as a smart card? Set up a virtual private server. Can you trust CPU usage numbers? Do you really need a modern desktop PC to get your work done? DVDs are too fragile to keep without backups. Federate your indexes to enhance searches. Marcel Gagné's Cooking with Linux Tonight's Menu: Diner's Choice!